Paragon China "Tree of Kashmir" pattern. 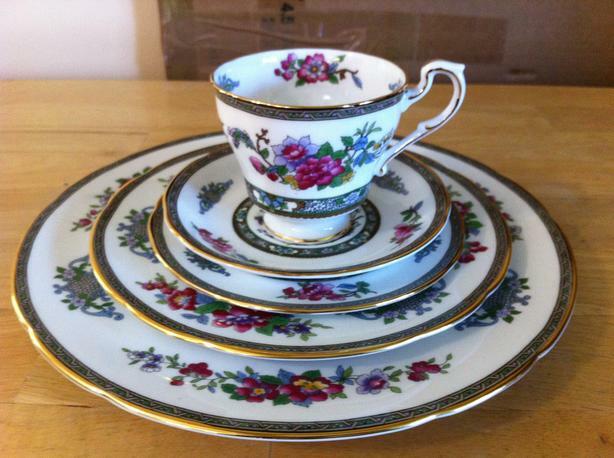 This fine bone china set is comprised of 8 full place settings (dinner plate, salad plate, side plate, cup and saucer) plus a bonus oval serving dish. Gold trimmed scalloped edges add an extra elegance to this pattern. All pieces in excellent, like new condition with no chips or cracks. Priced at far below original cost (serving dish alone cost $300 new! ).